When we run a test written for Simpletest, the latter uses the existing codebase and instructions found in the test to create a separate Drupal environment in which the test can run. This means adding additional tables to the database (prefixed by simpletest_) and test data that are used to replicate the site instance. Depending on the type of test we are running and what it contains, the nature of this replication can differ. In other words, the environment can have different data and core functionality depending on the test itself. What kinds of tests are there in Drupal 8? There are two main types of tests that we can write for Drupal 8: unit tests using PHPUnit (which is in core now) and functional tests (using Simpletest). However, the latter can also be split into two different kinds: web tests (which require web output) and kernel tests (which do not require web output). In this article we will practically cover only web tests because most of the functionality we wrote in the previous articles is manifested through output so that’s how we need to test it as well. Writing any type of test starts by implementing a specific class and placing it inside the src/Tests folder of the module it tests. I also encourage you to read this documentation page that contains some more information on this topic as I do not want to duplicate it here. As I mentioned, in this article we will focus on providing test coverage for some of the business logic we created in the series on Drupal 8 module development. Although there is nothing complicated happening there, the demo module we built offers a good example for starting out our testing process as well. So let’s get started by first determining what we will test. We have a route that displays a page with a specific message loaded from a service. We have a route that displays a form and which has some configuration. We have a custom block plugin we can configure and add to a page. That’s pretty much it. The custom menu link we defined inside the demo.links.menu.yml could also be tested but that should already work out of the box so I prefer not to. For the sake of brevity and the fact that we don’t have too much we need to test, I will include all of our testing methods into one single class. However, you should probably group yours into multiple classes depending on what they are actually responsible for. Here we have a simple test class which for every test it runs, will enable the modules in the $modules property and create a new user stored inside the $user property (by virtue of running the setUp() method). For our purposes, we need to enable the demo module because that is what we are testing, the block module because we have a custom block plugin we need to test and the node module because our logic uses the access content permission defined by this module. Additionally, the user is created just so we can make sure this permission is respected. For the three bullet points we identified above, we will now create three test methods. Keep in mind that each needs to start with the prefix test in order for Simpletest to run them automatically. And here is the code that does it. 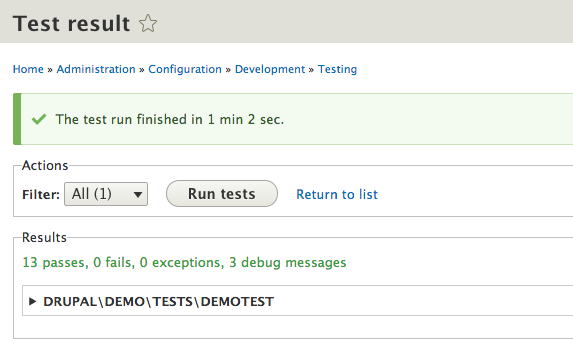 First, we log in with the user we created in the setUp() method and then navigate to the demo path. Simpletest handles this navigation using its own internal browser. Next, we assert that the response of the last accessed page is 200. This validates that the page exists. However, this is not enough because we need to make sure the text rendered on the page is the one loaded from our service. For this, we statically access the \Drupal class and load our service. Then we assert that the page outputs the hello message composed of the hardcoded string and the return value of the service’s getDemoValue() method. It’s probably a good idea to write a unit test for whatever logic happens inside the service but for our case this would be quite redundant. And that’s it with the page related logic. We can go to the testing page on our site, find the newly created DemoTest and run it. If all is well, we should have all green and no fails. The first step is like before. We go to the form page and assert a successful response. Next, we want to test that the email form element exists and that its default value is the value found inside the default module configuration. For this we use the assertFieldByName() assertion. Another aspect we need to test is that saving the form with a correct email address does what it is supposed to: save the email to configuration. So we use the drupalPostForm() method on the parent class to submit the form with a correct email and assert that a successful status message is printed on the page as a result. This proves that the form saved successfully but not necessarily that the new email was saved. So we redo the step we did earlier but this time assert that the default value of the email field is the new email address. Finally, we need to also test that the form doesn’t submit with an incorrect email address. We do so again in two steps: test a form validation failure when submitting the form and that loading the form again will not have the incorrect email as the default value of the email field. For this test we need another user that also has the permission to administer blocks. Then we create a new instance of our custom demo_block with no value inside the Who field and assert that a successful confirmation message is printed as a result. Next, we navigate to the front page and assert that our block shows up and displays the correct text: Hello to no one. Lastly, we edit the block and specify a Test name inside the Who field and assert that saving the block configuration resulted in the presence of a successful confirmation message. And we close off by navigating back to the home page to assert that the block renders the correct text. In this article, we’ve seen how simple it is to write some basic integration tests for our Drupal 8 business logic. It involves creating one or multiple class files which simply make use of a large collection of API methods and assertions to test the correct behavior of our code. I strongly recommend you give this a try and start testing your custom code early as possible in order to make it more stable and less prone to being broken later on when changes are made. Additionally, don’t let yourself get discouraged by the slow process of writing tests. This is mostly only in the beginning until you are used to the APIs and you become as fluent as you are with the actual logic you are testing. I feel it’s important to also mention that this article presented a very high level overview of the testing ecosystem in Drupal 8 as well as kept the tests quite simple. I recommend a more in depth look into the topic going forward.